The Kenya Airways plane, that left the Jomo Kenyatta International Airport in Nairobi on Sunday night, is pictured at the John F. Kennedy International Airport in New York, the United Stats, after landing on October 29, 2018. 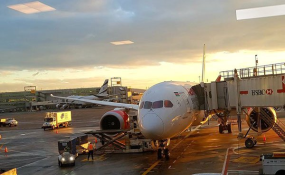 Kenya Airways Boeing 787-8 Dreamliner has finally left the Jomo Kenyatta International Airport (JKIA) for New York City, USA, in a historic flight in Kenya's aviation industry. President Uhuru Kenyatta led senior government officials who arrived at the airport to bid farewell to the inaugural direct flight from Kenya to the US. Foreign Affairs CS Monicah Juma led the government delegation aboard the flight. Several choirs entertained guests before its departure. Security was tight at the airport throughout Sunday evening to ensure no mishap arose. Speaking shortly before the departure, President Kenyatta said that the direct flights will open up Kenya to the rest of the world. "These flights are set to provide a seamless experience for business and leisure travellers alike. It will allow the world to taste Kenya's diverse cultures and hospitality," he said. The plane has 234 passengers on board. This is a big milestone in the flight history between the two countries, as normal flights from Kenya to the US takes up to 22 hours in a distance of 13,713km between Nairobi and New York. However, passengers will save up to seven hours, as this flight will take 15 hours only. Of the 234 passengers, 30 will be in economy class, while 204 will be in economy class. After Sunday night's departure, the plane will land at the JF Kennedy International airport. Up to now, only eight African countries have direct flights to the US. These countries include Senegal, Ghana, South Africa, Ethiopia, Egypt, Morocco, Nigeria and Cape Verde. The charges for the new flight range between Sh89,900 return ticket for an economy class, while the same cost Sh260,000 for a business class. And diverting from the normal flights, the plane will have four pilots, and 12 attendants. The plane will consume 85,000 litres of fuel in a one-way trip. Apart from Dr Juma, other senior officials aboard are Cabinet Secretary James Macharia, Kenya Airways chief executive Sebastian Mikosz and chairman, Michael Joseph among others. The adoption of the 787-8 Dreamliner for the flight is its unique make. According to its features, on the manufacturer's website, among its ideal features is its great comfort. The plane is also made of 50 percent composite materials, carbon fibre-reinforced polymers that are both lighter and more durable than traditional aluminium. Composite materials have been used before in passenger planes but never to this extent. They comprise both the wings and the fuselage of the 787.